July 2017 – Planet Geek! As any quadcopter / drone pilot knows, the more batteries you have on hand, the longer you can stay out doing what you love – flying! Unfortunately, this comes at a price, and no I don’t mean the cost of the batteries. Those puppies need to be recharged before you can get up in the air again. When the sport started, many people had single chargers – a single power source that could charge one battery at a time. That didn’t last long, and gang / parallel chargers became the norm for active pilots. But charging batteries in this way needs a little math. And since I spent this morning doing it the WRONG way, lets quickly go over the RIGHT way to do this. First, lets review the pieces. A power supply. The juice has to come from somewhere. I’m working with 3S batteries, which run at 12v so my PS needs to match that. 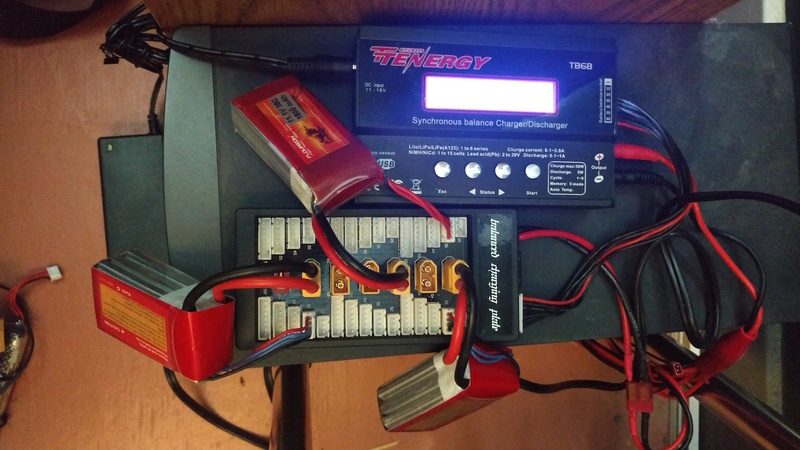 Tenergy sold a very nice little power supply with the charge controller I use. The most important thing to note on the PS is it’s rating. Mine is 5000ma (5 amps). I can’t draw more current than that. Remember this later. A Balancing Charger. I use a Tenergy TP6-B charger, which has served me super-well. A balance charging board. There’s zillions of these out there, ranging in quality all over the map. They’re pretty simple devices. Looks like Crazepony has a decent one that includes fuses. I picked up a cheap chinese version a year or two ago. A charging bag. This is for your own safety and the safety of your house, but it’s a good idea no matter how you slice it. I use a bag most of the time, though the photos below do not show it. Great, but, what amps to use? And thus the question is asked. When using a balancing charger like the Tenergy, there’s several menu options for how many amps to charge with. 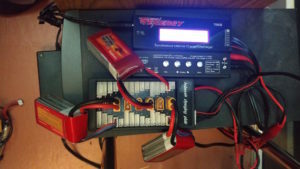 The general rule of thumb is you should charge your LiPo batteries at ‘1C’, meaning putting the amps into the battery that matches it’s capacity. For my batteries, they have a capacity of 1500mah, so I should charge them at 1.5A. Easy, huh? Now we start talking about parallel charging, where you’re charging more than one battery at a time. They are hooked up in parallel (so in essence look like one big battery to the charger), so when calculating what amperage to use, just add up all the capacities. BUT! (there’s always a but, huh?) – whatever power supply you’re using can only provide so much current. Look on the power supply and you’ll see something like “Maximum 12v 5000mah” (or might just say ‘5A’). That’s the maximum current the power supply can crank out. You should never set up your charger to draw more than that value. It may work, but you’ll be stressing your power supply and could over heat / damage it. So, given all this, with my power supply rated at 5000mah, and I’m working with 1500mah batteries, I can charge 3 batteries at a time. I set the charger to provide 4.5A power at 12v, plug my batteries (and the balance plugs) into the board, and hit go! So what did I screw up? Well, somewhere along the line, I had forgotten the basic math above, and have been charging only 2 batteries at 1.5A. Which, as you can imagine, takes something like an hour and a half per charge. Somehow I got the cobwebs out of my brain and remembered the math, and just recharged 3 1500mah batteries in 45 minutes. Smartwatches. They’re the new cool toy for geeks. Having a small mainframe on your wrist sounds pretty nifty. But has the time come for everyone to strap a mini-cray to an appendage? I’m honestly not sure. I’d been resisting jumping onto the smartwatch bandwagon for a long time. When Pebble proved that there was a demand for the gadgets, I watched with interest, but the device didn’t seem polished enough to be worth the expense. So I waited. Then the Apple Watch came along, and I was still underwhelmed. Super expensive, and because I no longer used an iPhone, not really helpful to me. Then Android Wear happened, and I began to take an interest. The first generation of smartwatches was pretty limited. Low battery life, poor performance, clunky look. I wasn’t feeling the buzz, but I could see there was potential there. Then Android Wear 2.0 was announced, and I realized my time was near. The amount of time I was spending looking at my phone was reaching criticality. I needed a way to be able to be notified about meetings and messages, without having to haul out the damned black slab everytime. And, lets be honest, I like knowing what time it is. So yes, one of the reasons I wanted a smartwatch was I wanted to use it… as a watch. My employer has a great perk in that you get an allowance each year to spend on health related items. A gym membership, a yoga class, or… a smartwatch, for helping track activities. Given this final nudge, I decided it was time. Now the next step is to choose which one. I knew I wanted Android Wear 2.0 compatible devices, and also wanted something that didn’t look completely dorky. I have an advantage in that I have big hands, so most of the watches would look just fine next to my meaty paws. I settled on the Fossil Q Founder Gen 2. 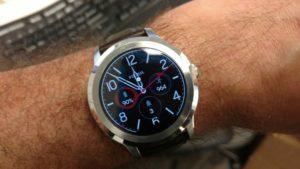 I liked the looks, the price was reasonable, and it was Android Wear 2.0 compatable. The styling was quasi-retro, in that it had a light brown leather strap, stainless steel case, and classic lines. Amazon click, and it was on its way. I like it. I find it attractive, comfortable, and useful. It is a very good watch. I love that I can customize the watch display to show me other small tidbits of information. Temperature, how many messages I have waiting, how many steps I’ve taken today, battery level, etc. They are all available at a glance, with the display going into a simpler mode when the watch face is not turned toward me, thus saving battery life. I’ve always been a sucker for geeky watches. I totally had a Casio Databank when I was a kid, and later moved up to good backpacking / hiking watches for backcountry stuff, but this is in a league of it’s own. This is a machine with 4gig of storage, a gig of RAM, and a 64bit 2.1ghz CPU with 3d graphics capability. Those are specs you’d see on a desktop machine from a couple years ago, all on a computer that lives on your wrist. I have to say, it’s… okay. Don’t get me wrong, it’s an excellent watch. It tells time, shows me some basic information that I need to have quick access to, but… I’m not blown away by it’s utility. I find the act of staring at it, manipulating menus or scrolling through options, or using a swype-like interface to write a text message tedious and awkward. If I’m going to do any of that, I might as well pull out my phone, which I have to have with me at all times anyway, because the watch basically functions as an extension of the phone. At this, it excels. If I find a function doesn’t work or is unavailable on the watch, I can whip out the phone and get things done. So where does this leave us on the plusses or minuses of a smartwatch? Unfortunately, it’s still in a gray area. As a geeky watch, I think they’re cool and nice looking and work. As a logical extension of the phone in a new and useful way, I think there’s a long way to go.